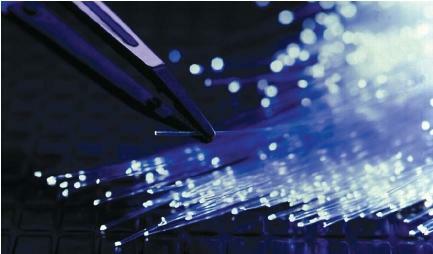 Optical fiber is a very thin strand of glass or plastic capable of transmitting light from one point to another. Since the late 1950s, optical fibers have emerged as revolutionary tools in the fields of medicine and telecommunications. These fibers can transmit light pulses containing data up to 13,000 miles (20,900 kilometers), and do so without significant distortion. The fibers also permit the "piping" of light into the body, allowing doctors to see and diagnose conditions without the use of surgery. Optical fibers operate by continuously reflecting light (and images) down the length of the glass core. Optical fibers are manufactured in a multistep process: the inner wall of a silica glass tube is coated with 100 or more successive thin layers of purer glass. The tube is then heated to 3,632°F (2,000°C) and stretched into a strand of thin, flexible fiber. The result is a clad fiber, approximately 0.0005 inch (0.0013 centimeter) in diameter. By comparison, a human hair measures 0.002 inch (0.005 centimeter). Optical fibers were first used in medicine in the late 1950s when fiber optic bundles were added to endoscopes (optical instruments used to examine the inside of hollow organs or tubes in the body). The new endoscope, called a fiberscope, consisted of two bundles of fibers. One bundle carried light down to the area to be studied, while the other carried a color image of the area back to the physician. Because of its small size and flexibility, the fiberscope can view many areas inside the body, such as veins, arteries, the digestive system, and the heart. The field of telecommunications first used optical fibers in 1966. Today a telephone conversation can be carried over optical fibers by a method called digital transmission. In this method, sound waves are converted into electrical signals, each of which is then assigned a digital code of 1 or 0. The light carries the digitally encoded information by emitting a series of pulses: a 1 would be represented by a light pulse, while a 0 would be represented by the absence of a pulse. At the receiving end, the process is reversed: light pulses are converted back into electronic data, which are then converted back into sound waves. important where telephone cables must be placed underground in limited space. The tiny size of optical fibers also brings about a significant reduction in the weight of a particular system. Replacing copper aircraft instrument wiring can save up to 1,000 pounds (454 kilograms), allowing for more economical fuel consumption. Optical fibers are also immune to electromagnetic interference, making them roughly 100 times more accurate than copper. They typically allow only 1 error in 100 million bits of data transmitted. Optical fibers have proven to be an ideal method of transmitting high-definition television (HDTV) signals. Because its transmission contains twice as much information as those of conventional television, HDTV features much greater clarity and definition in its picture. However, standard television technology cannot transmit so much information at once. Using optical fibers, the HDTV signal can be transmitted as a digital light-pulse, providing a near-flawless image. HDTV reproduction is far superior to broadcast transmission, just as music from a digital compact disc is superior to that broadcast over FM radio.